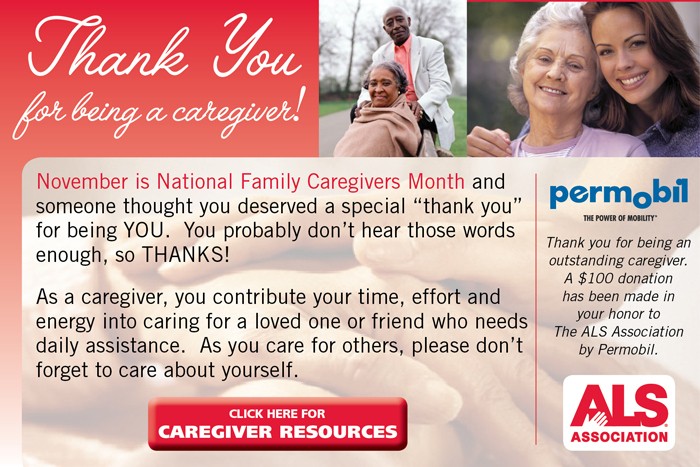 Join in our celebration of caregivers by sending a “Thank You” eCard to all the caregivers you know and appreciate. The eCard acknowledges and honors their contributions and offers resources to support their dedication to all those affected by ALS. This year you can support the fight against Lou Gehrig’s Disease even more. Our national sponsor, Permobil, will donate $100 for every eCard you send up to $25,000. Hint: Limit 10 email addresses per send.